Sunday Jazz, the longest-running regular event of Bandung-based Jazz Community, Klab Jazz is supposed to run this Sunday as scheduled. Unfortunately, due to some reasons it can’t be held on this particular day. Klab Jazz doesn’t want to cancel it, so the community decides to ‘improvise’ by moving it a day later. Since the show won’t run on Sunday, the name for this edition is changed to “Monday Jazz Special”. “What I mean as ‘special’ is that the regular show will keep running on Sunday. Only one episode is moved to Monday until further notice.” said the founder Dwi Cahya Yuniman. So, for the first time in Klab Jazz’s history there will be a regular event runs on Monday. 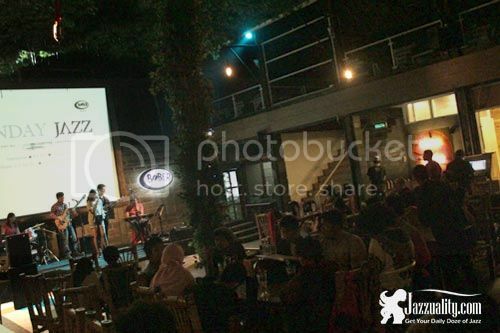 As how Klab Jazz’s events are, the Monday Jazz Special features young jazz groups that, hopefully, will give valuable contributions to the Jazz scene in Bandung and also in Indonesia. Assorted Jazz goodies will be there for you to choose, brought by 5 bands in various styles. The straightahead Jazz will be represented by Chakraborty, then Makaloo will serve the style of straightahead with Latin tinged. A unique Jazz twist is going to launch by Satura featuring Agis Kania. Satura is a duo that can already steal the attention of the audience with their gipsy-like guitar playing, but this time they are going to double the pleasure by involving a soulful vocalist inside courtesy of Agis. The students of ITB representing ITB Jazz named Uncle & the Escape is ready to highlight the groove side and last but not least, a teenage jazz project, VR Project is completing the lineup. If usually Klab Jazz serves one of the event on Sunday to accompany your last resting hours before the work days begin, this time the community is going to bring it on Monday night, starting from 7:00 pm until 10:00 pm at Bober Cafe Tropica, Bandung. Who knows, it might be good since you can have some jazz treatment to chill down after being busy with all your activities the whole day while enjoying the tasty meals and drinks courtesy of the venue. The event is brought to you FREE as always. With better sound quality and 5 bands in different styles, this special edition offers a good jazz-tertainment for you. So what are you waiting for? Just come and join. Keep supporting the local jazz community, the young bands and keep being a part of the jazz development in Bandung and Indonesia in general.